His story has now been told by sports reporters throughout the hockey world: the unlikely tale of a determined athlete, never drafted, and overlooked by NHL teams until late in the 2016-17 hockey season when the Penguins plucked him from the minors at the advanced age of twenty seven and they won the Holy Grail of Hockey. Carter remains furiously loyal to his small town roots. In an interview (Stan Neufeld) with Carter he stated “Upon winning the cup I wanted to do something special for Sexsmith and Grande Prairie. I grew up in this community and it will always be home. You only get the cup for so long and I wanted it to be here. “I have family and friends here. 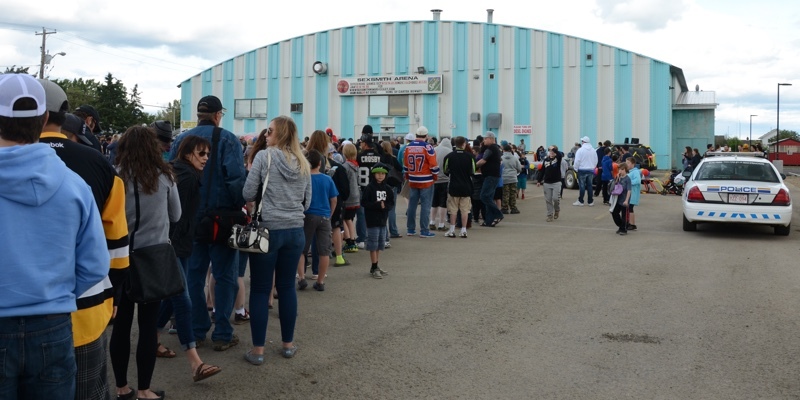 Sexsmith (population 2400) is where hockey started for me at the age of six.” Carter’s loyalty to his hometown and his determination to share the cup with family and friends is refreshing and that loyalty was reciprocated as demonstrated by the welcome that Sexsmith and the surrounding community extended to him and his family when he came home with the cup on July 16, 2017. 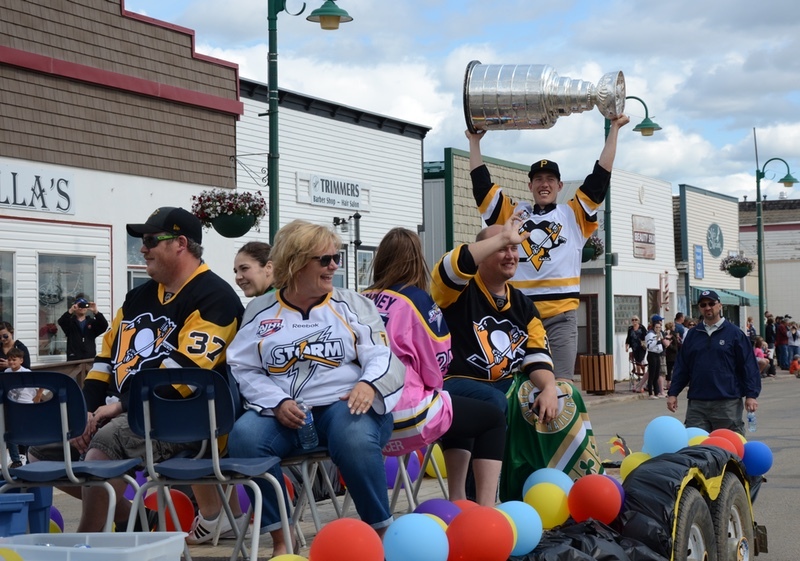 On his homecoming the population of Sexsmith doubled with friends and admirers from Grande Prairie and the surrounding district swarming the town. To show his community minded nature, Carter even returned to Revolution Place with the cup to show it off to the kids who benefited from the 3D charity hockey tournament in May. He once played in this charity event. 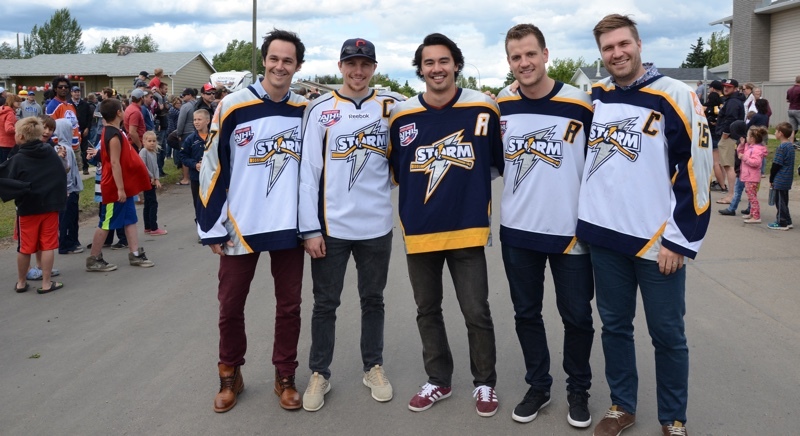 He posed for photos, gave autographs and also made time to meet with other groups in both Sexsmith and Grande Prairie. Carter with former teammates and coaches including: Marc Beaudoin, from left, kneeling, and Morgan MacLean. Carter’s story is a reminder of the important role that hockey plays in small towns throughout our country and a reminder to young people throughout Canada that a career in the game is not out of reach to players who come from small remote communities. The Province of Saskatchewan provides us with examples of players that were born and raised in even smaller towns than Sexsmith. They include Patrick Marleau, Aneroid, population – 50, Bryan Trottier, Val Marie population – 137, Wendel Clark, Kelvington, population – 864 and Theoren Fleury, Oxbow, population – 1,328. 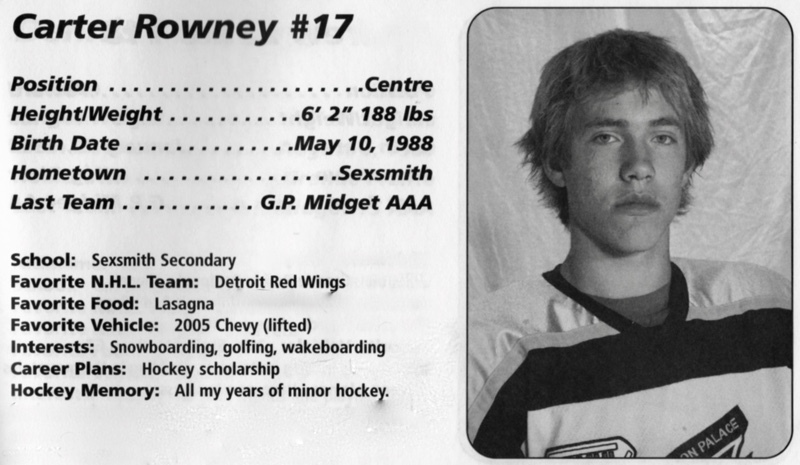 Sexsmith is especially interesting in that three players Duke Edmundson, Jason Duda and now Carter Rowney were born in that community and made it to the pros. As for out-of-the-way places with small populations consider Jordin Tootoo from Churchill Manitoba, population – 923 and Carey Price who was raised from age three in Anaheim Lake, B.C., population – 1500. My elder brother Ron remembers Sexsmith in the 1940’s – the era of GP Hockey Legend Duke Edmundson who was born in Sexsmith. The population was approximately 300. Heading north on Highway Two from Grande Prairie a long line of grain elevators - eight of them came into view. The stately structures stood out like sentries along the Northern Alberta Railway’s (NAR) ribbon of steel that carried grain from Sexsmith to markets throughout the world. It was the “Grain Capital” of the British Empire. Across the tracks along a broad board sidewalk facing the elevators stood several business establishments including a grocery and hardware store, small hotel and a pool hall: a gathering place where farmers in their coveralls could take a break from their twenty-four hour a day occupation. With pool cue in hand they would circle the table while discussing grain prices, farming practices, politics, and hockey. Sexsmith was a remote northern agricultural town. On the farm tractors were beginning to replace horses. Cars and buggies shared the road but horses still had the right of way. How conditions have changed! I’m not familiar with the Rowney’s early family history and details concerning their move to the Peace River country but Carter reports that he spent the first ten years of his life on a farm in the Sexsmith area. He says nothing about milking cows or wrestling horses into their harnesses in the early morning hours but he does lay claim to having operated a combine. Surrounded by farm machinery while he was growing up I would be willing to wager that Carter did not have to enroll in a driving school in order to obtain a Driver’s License. I would make a further wager that growing up on a farm contributed to Carter’s’ strength and his work ethic as an elite hockey player. Puck control and winning battles for the puck in the face off circle and along the boards is a hallmark of Carter’s hockey game. That requires superior strength and is due in part to muscle development that he can attribute to performing daily chores on the farm. Even on a mechanized farm a great deal of manual labour and physical work is required – like shoveling grain. Today in Sexsmith’s town centre the old boardwalk has been replaced by cement curbs and the once gravel covered main street has been paved. Many townspeople commute to jobs in Grande Prairie and for specialized services but there is a distinct “down town” that provides all of the local’s daily needs. 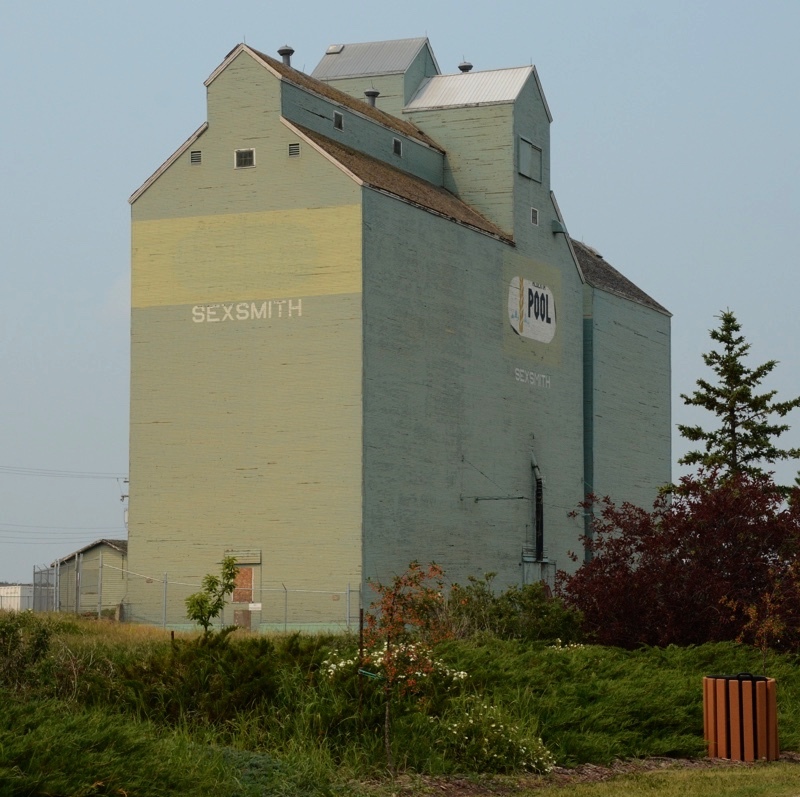 Sexsmith is a proud community that has preserved a “small town” atmosphere. Locals don’t expect, nor is it likely they want anonymity when they are in town. In keeping with the nature of small towns Sexsmith was and is today a friendly place where people that meet exchange greetings and neighbours take time to find out what is going on in the lives of others and go out of their way to provide support when need arises. In a small town setting finding a crew to clear snow from a pond or construct a rink in a neighbourhood for skating and outdoor hockey does not require a major organizational effort. It takes the form of an informal “happening” that brings together volunteers who are interested in making sure there are recreational opportunities for the local kids and the “work bee” becomes a pleasant social event. In celebrations following game six of the Penguins successful bid for the Stanley Cup (1916/17 season), CBC’s Min Dhariwal interviewed members of the Rowney family that attended the game. Carter’s older brother Kris recounted his childhood memories of playing hockey out-of-doors in Sexsmith with his brothers Carter and Clayton. “We had a neighbour down the road,” recalled Kris. “He had a dugout outback (a man-made pond) where he had boards, lights and a little change room. It was a hunting shack in the summer and served as a change room in the winter. I mean, any chance we had we were over there in the evenings playing hockey, playing pond hockey.” In an interview with me (Stan Neufeld) Carter was quick to recognize the vital importance of family support for his success i.e. his parents, Brian and Tracy along with brothers Clayton and Kris. “My two older brothers Clayton and Kris had me on the farm pond early in my youth. I always wanted to beat them at stuff but that never ended up going very well for me.” Clayton and Kris can point to this comment as an illustration of “tough love”. Carter built on this foundation to realize his dream. Dale Collins one of Carter’s minor league coaches observed “Carter was not over-organized nor over-coached: something that happens in larger youth leagues where skilled athletes can get lost in a crowd. He became good in a small town, everybody knew it and that provided enormous self-confidence.” (Stan Neufeld interview). That was undoubtedly Duke Edmundson’s experience. He was another Sexsmith born lad from an earlier generation (born in 1932) who made it to the NHL. Duke’s Father, a talented hockey pioneer in the Peace River country worked for the NAR in Sexsmith, played hockey with the local senior team and later, following a move to Grande Prairie he was a star player and coach for the Legendary Red Devils. Frank was determined that his son Duke would play hockey and although we lack details it is likely that as soon as Duke could walk he was equipped with skates, perhaps bob skates and introduced to skating and hockey on a pond or a back yard rink. In small towns with senior hockey teams players from a younger generation often choose role models - local heroes the kids have watched and admired on the ice, meet on the street and know personally. This was certainly Duke’s experience and he had the added advantage of serving the Grande Prairie Red Devils as stick boy when his Dad was the coach. Both Duke and his younger brother Bryan played minor and senior hockey in Grande Prairie. Duke (see Hockey Legends article) moved on to play Junior Hockey in Edmonton with the Edmonton Athletic Club and made it to the NHL. Going back to Frank Edmundson’s era Sexsmith can identify a continuous line of talented hockey players. Sexsmith is developing a heritage museum worth visiting that features a growing collection of buildings and historical artifacts to remind us of conditions faced by Sexsmith pioneers. 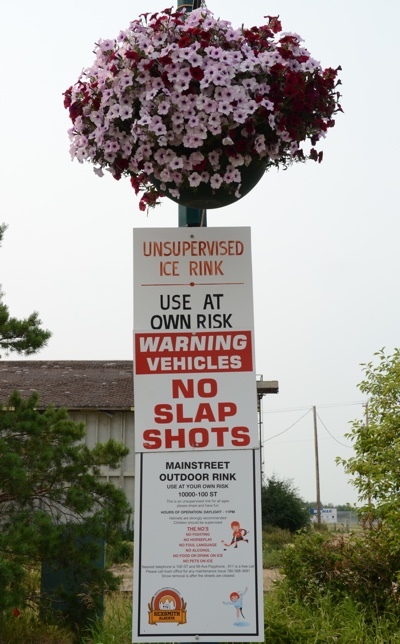 Hopefully the Museum will include reminders of hockey history in Sexsmith that is older than the town itself. It predates 1929 when Sexsmith gained village status. The town did not have a senior team when I (Ron Neufeld) was playing minor hockey in the old Wapiti Arena in Grande Prairie in the 1940’s and 50’s but they had a very respectable junior hockey team. Clayton, Kris and Carter were not the first trio of brothers to “light it up” for hockey in Sexsmith. In the 1940’s the Gudryn Brothers: Carl, Ernie and Willie were the backbone of the team. I suspect that they were all possible candidates for careers in hockey but Sexsmith was not included on the itineraries of NHL scouts. Carter and his brothers experienced a period of transition from conditions in the forties of Duke Edmundson and the Gudryn Brothers to Sexsmith as we know it today. During that transition two related issues stand out: one – the effect on them of growing up in a small town and two – for lack of better terms, the formalization or modernization of the game of hockey. As it relates to modernization, hockey is no longer the only game in town during the winter. Many activities compete for the attention of young people. Also, the facilities for playing hockey today are not as accessible as they were when there were backyard rinks and ponds. 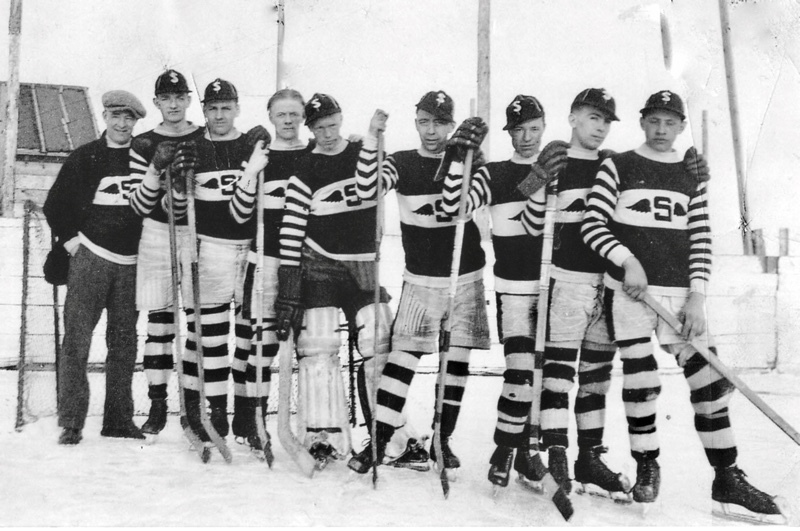 There were no admission fees for backyard rinks and ponds and no rigid hours except for Mom’s mandate, “Get home before dark.” Today playing hockey on outdoor ponds is uncommon and one will not see kids on the ice wearing Sears and Roebuck catalogues held in place by binder twine to protect their shins. It is unlikely that they even know what catalogues and binder twine are. Hockey is much more formalized and the cost of equipment and ice time prevents many children from playing. Concerning the impact of growing up in a small town, research has been conducted supporting the claim that growing up in a small town is an advantage to kids that aim for a career in sport. So – what are factors that contributed to Carter’s journey from small town Sexsmith to the NHL? It seems to me that all of the elements discussed above were elements in Carter’s development and contributed to his successful bid to play in the NHL: identifying with local role models, ready access to ice, participation in various sports activities and an abundance of free ice time without adult supervision. He was not over coached. While Carter acknowledges the benefits he experienced from unstructured free play while growing up in Sexsmith he gives credit to the guidance he received from coaches as he was developing. 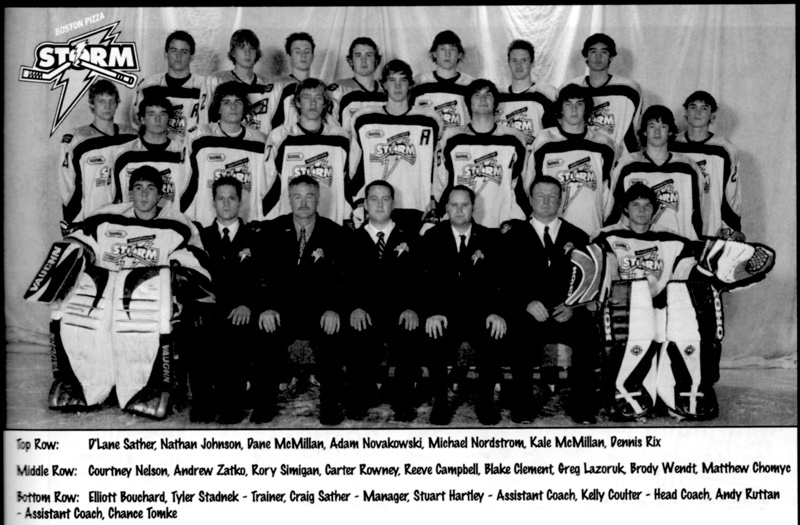 “I remember every one of my coaches and they all played a huge role in my development both on and off the ice. One of my cousins, Darren Hawkes and Curt Trydal were among my coaches back then.” (Stan Neufeld interview). Kelly Coulter has coached many young players and in retrospect he reports, “If there was one kid I thought could go all the way it was Carter – he always wanted to improve”. Coulter went on to say that a persistent work ethic, positive relationships with team-mates, his hockey smarts, vision on the ice and superior skill in the face off circle were characteristics that fueled his belief that Carter could make it to the NHL. With reference to training in the face off circle, “I must have dropped 10,000 pucks.” The scars on Coulter’s shins bear witness to that exercise. 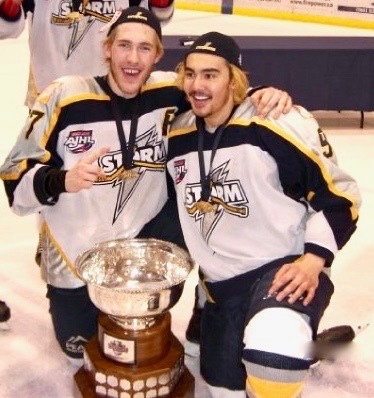 Coulter went on to say that Carter and Carter’s team-mates, Mark Stojan, Blake Clement, Tanner Fritz, Ricky Wong, Dwane Sather, and Chance Tomke were an unusually talented and fun-loving group: one of his favourite contingents. “We would always tell the kids: it’s family, education then hockey. It impressed Coulter that immediately after winning the Stanley Cup “The first thing Carter posted from his victory was all about family - his kid in the cup. That’s what it’s all about. That’s what made us successful.” (Stan Neufeld interview). Heading into the championship series coach Vandekamp knew that a superior performance from Carter was essential if the Storm was to win. Furthermore it was Vandekamp’s contention that Carter did not know how good he was. In a conversation with Carter prior to the series the coach shared his perception that Carter was the key to their winning and he challenged him with the responsibility of carrying the weight of the team’s success on his young but sturdy shoulders. Cater rose to the occasion – he had an outstanding series – his team came home with the trophy and Carter was the playoff series MVP. It was Vandekamp’s belief that “Sometimes you have to force a player into making him realize how much of an impact a person can actually have on a game.” That’s a “catch twenty two” for an individual like Carter with a genuine and admirable unassuming and humble nature. After playing with the Storm Dennis played four seasons with Michigan Tech and earned a Bachelor’s degree in Business Management. 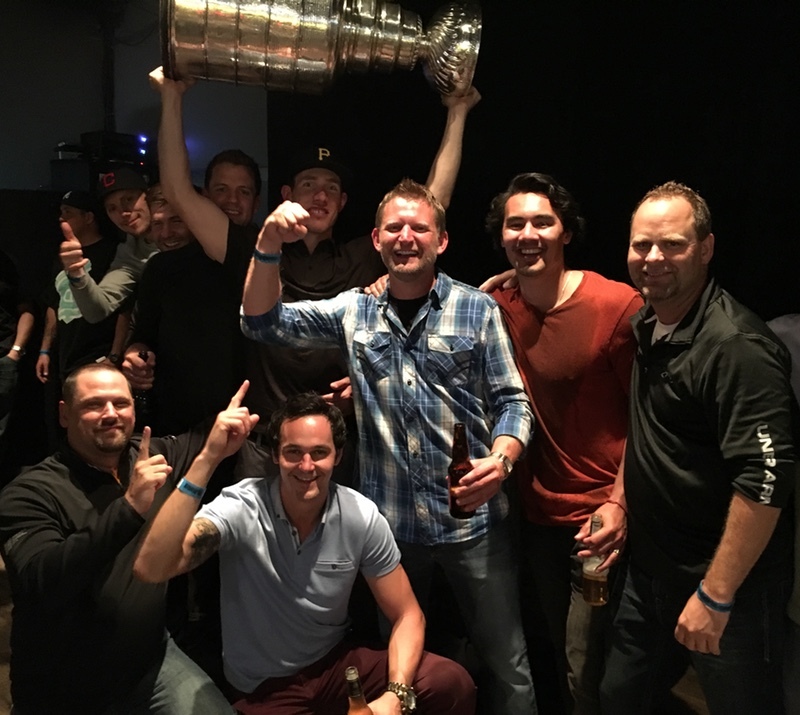 From Michigan Dennis journeyed to Scotland where he played one year with the Edinburgh Capitals of the Elite Ice Hockey League while obtaining an MBA before returning to Grande Prairie where he continues to coach and has taken the reins of the Business Office. Dane Jackson, Associate Coach of the University of North Dakota Fighting Hawks was behind the bench during Carter’s four years in Grand Forks. 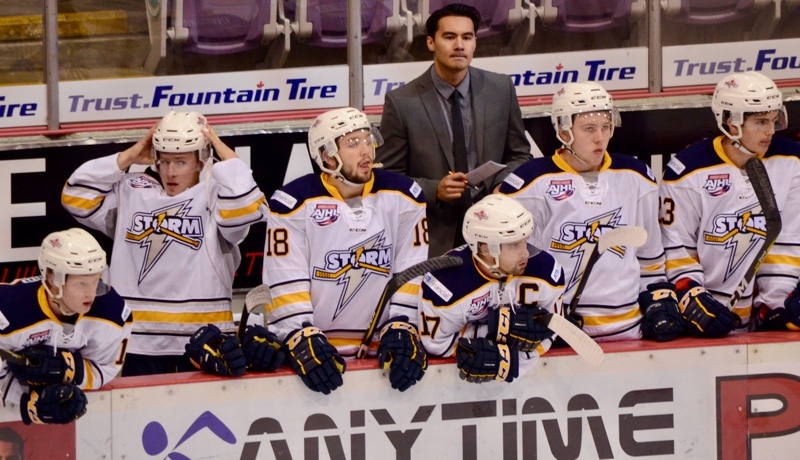 In an interview (Stan Neufeld) with Jackson he commented, “He’s had good coaches along the way but made the most of his opportunities because of his every day mentality.” That’s a tribute not only to Carter but the coaching he received in his hometown of Sexsmith and Grande Prairie. Jackson went on to report that he especially liked Carter’s two-way game: his defensive skills and his ability to protect the puck and win face offs. According to Jackson Carter did not immediately “light it up” upon his arrival in Grand Forks. However, he improved steadily and during Carter’s four years with the Fighting Hawks they won three WCHA titles, twice Carter was selected to the WCHA All-Academic Team and he was Alternate Captain of the team during his senior year 1912-13. Reminiscing with Stan Neufeld about his college hockey career Carter stated, “Grande Forks is not overly large and much like Grande Prairie including similar weather. I liked it there and felt at home right away. We had a great arena with unbelievable fans. We filled the rink every game with 12,000 fans.” While playing Collegiate hockey Carter earned a degree in Managerial Finance and Corporate Accounting. Overshadowing all of Carter’s academic and athletic achievements in sports and in the classroom was his connecting with and marrying Danielle Luetzen. Danielle “lettered” in volleyball at UND and leading up to the 2017 NHL playoffs Anders, their firstborn came along. You can bet that Carter’s marriage to Danielle, the birth of Anders and winning the Stanley Cup are three events that will be forever etched on the Carter Rowney family calendar. Carter’s first performance as a professional was in 2013 with the Abbotsford Heat of the AHL. He played just four games with the Heat before becoming Pittsburgh Penguin property – first with the Wheeling Nailers and then with the Baby Penguins located in Scranton/Wilkes-Barre Pennsylvania. Three years later on January 31, 2017 at the age of 27 Carter made his NHL debut in a game against Nashville and on February 4 in a game against St. Louis he recorded his first NHL point. 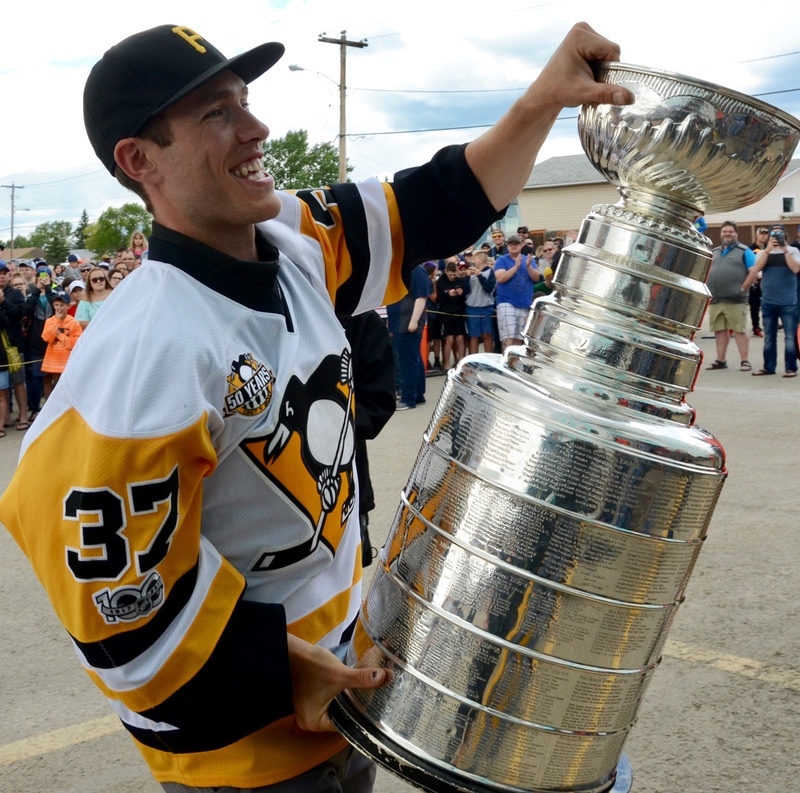 In game six of the 2017 Stanley Cup finals the Penguins with Carter Rowney on their roster defeated the Predators and Carter joined his teammates in hoisting the Stanley Cup. Glued to TV sets and cheering him on were Carter’s numerous fans in Sexsmith and Grande Prairie. His family was ringside at Game Six to share his excitement. It should be noted that not everyone in Carter family circle was impressed on the day Carter and his Penguin teammates hoisted the cup. One person snored through all of the excitement. It was Carter’s nine-week old son Anders who is pictured - sound asleep in the Stanley Cup between the watchful eyes of his proud parents. Years hence Anders will have the opportunity of making up for his lack of awe on that day. Hockey is not a gentle sport and looking ahead the time will come when Carter’s career as a player will end and Anders will see the toll his Father’s body has taken from delivering and absorbing countless body blows. Predictably Anders will be interested in hearing his Dad’s story and his heart will swell with pride when he looks at the infant in the cup and as his Dad recounts his hockey adventures. Stan Neufeld asked Carter if he would like his son to play hockey. Carter answered in the affirmative. “I love hockey and the sport so would love it if he chooses to play but it’s whatever he wants at the end of the day. If he chooses to play hockey I will be pressing for him to represent Canada but at the end of the day I just want to be a proud parent.” If Anders elects to play hockey it will not be a function of parents living their dreams through a child. It is clear from interacting with Carter’s parents that Cater’s career path was of his choosing. They provided the support along the way but Cater’s decision to pursue a career in hockey was his choice without manipulation from his parents. Carter’s constant and steady performance as an unassuming reliable two-way player is a reminder to hockey fans and hockey players everywhere that defense wins games. Offensive ability and flashy moves attract a great deal of attention and adulation from many fans and the media. However, connoisseurs of the game, coaches and goaltenders in particular are more impressed by the steady consistent hard work of a player who can be relied upon to place the team and the well-being of fellow players ahead of his/her own interests and that translates into goal prevention first. Carter’s skill in the face-off circle throughout the playoffs was an important part of Carter’s contribution to the Penguin winning ways in the playoffs. Kelly Coulter - the 10,000 puck drops that left tattoos on your shins paid off. Carter - rumour has it that you are being encouraged to purchase a home in Pittsburgh and I see your name on the 2017/18 Penguin’s 2017/18 roster. CONGRATULATIONS! Carter readily acknowledges that his journey has not always been easy. “My hockey career has been a long road, with ups and downs. I kept my head down, kept pushing forward and believed in myself. Good things happen when you put in the time and effort and believe in yourself. For young kids coming up - they have to believe anything is possible. The key is to work hard, deal with the ups and downs, so it’s not always going to be easy. It’s never an easy road no matter what you do in life. It`s how you handle it, it’s about pushing hard, learning from mistakes and striving to be better regardless of the job.” (Stan Neufeld interview). Carter - your place among the best hockey players in the world is well deserved and we – your fans in Sexsmith and Grande Prairie cheer you on.